Ever since it’s been introduced to the cannabis market a few years ago, Borderliner has been knocking socks off left and right and all over the place in the cannabis community. It’s one of the most potent and heavy yielding cannabis strains you can possibly buy, yet very little is known about its origins – we know it comes from the Amazon region of Brazil, but there is no information about its lineage, and there are some discrepancies on the Indica to Sativa ratio. The reviews, however, all agree that it produces very strong effects typical to Indicas, and that it’s a reasonably easy plant to grow, which makes it a very desirable strain for both personal and commercial growing. Even though when it comes to Borderliner cannabis strain most conversations about appearance fade out when the THC count is mentioned – it’s 25% – it should be said that Borderliner is a very strong looking plant. It has a thick, substantial stem and it produces a fair amount of leaves that give it a bushy appearance. The large buds are fairly frosty, light green with a lot of orange hairs, the kind of buds that put a smile on every connoisseur’s face. Borderliner is not a strain with a very strong smell, but the taste is very sweet, and it’s not too harsh on the throat and lungs when it’s smoked. The effects it produces are very Indica – a very strong stoned body feeling, relaxed and comfortable, that will definitely send even the most hardened of users into a state of blissful couch-lock. Because Borderliner cannabis strain is high in CBD as well as in THC, it is a very potent pain-reliever, which makes it a well-respected strain among people who use marijuana for medical reasons. Borderliner is a grower’s dream come true – a high-yielding, super-potent plant that doesn’t require anything but the regular care for it thrive. It doesn’t have any passed-on weaknesses to parasites or mold, it can grow well indoors and outdoors, it can be grown in a Sea of Green configuration, and there are no special points in the lifecycle of the plant where one should be especially worried about nute burn. 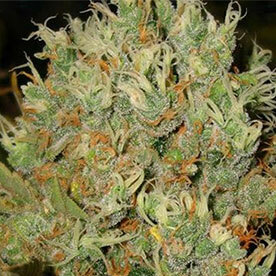 Borderliner is a cannabis strain that’s as delightful to grow as it is to use and kick back with. Borderliner isn’t an abundantly available strain, but finding a grow shop or seed bank where you could buy Borderliner seeds online shouldn’t be that hard. For best results, it would be wise to add “extreme” or “XTRM” after the strain’s name when searching for cheap Borderliner seeds online.